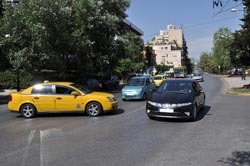 Greece has many taxis; Athens itself has some 17,000 of them and they are usually of a newer model vehicle and have price catalogues in a visible place. Pay attention to these price catalogues because some drivers may have unscrupulous practices. Also keep an eye on the meter that it is not registering an unreasonable fare. In general, by law, a driver may not refuse to transport you to your destination once you have gotten into the taxi. Taxi drivers tend to ask people where they want to go before they enter the taxi. This is a widely used trick that allows them to refuse a fare simply by saying that they have another fare on schedule. You must first ask the taxi driver if the taxi is available and then enter; only then should you reveal your destination. It is also a common practice to transfer multiple fares, so do not be surprised if the driver picks up another fare; it is perfectly legal. However, he is obliged to get you to your destination first, without deviating from the main route and only then change route to accommodate the other fare(s). In other words, a first come, first served order is kept. Taxis outside of Athens are coloured grey, blue or maroon and all can be hailed from the curb simply by stepping out and raising one’s arm. Inner city public transportation stops are usually in poor or very poor condition and do not offer WC’s. Bus schedules are dictated by traffic. Heavy traffic in major towns or cities can cause severe delays or even cancellations of certain schedules. Busses are new and well equipped, with a/c. Intermediate bus stops are very basic and sometimes consist of a signpost only. Rural bus travel is accomplished via the KTEL bus system which links towns and cities throughout mainland Greece. Bus schedules, however, are usually on time and most busses are new and well equipped, which is why they are widely used by Greeks and tourists. The terminals are usually old and mostly in poor condition except for a few and cleanliness is an issue, while they offer very few WC’s. Intermediate bus stops are very basic and sometimes consist of a signpost only. Other short stops are done at roadside restaurants with well equipped kitchens that offer food at reasonable prices. Train stations can be from poorly kept to quaint old stone buildings. The trains themselves are in good condition even though some are several decades old. As a whole, the train system is antiquated but new lines are being laid and old ones are being replaced. The train system although old is statistically very safe. One can find a wide variety of restaurants, taverns, canteens and a local version eatery called ‘mezedopolio’ (a tavern offering a choice of small portion dishes of varied tastes called ‘mezedes’). The mezedopolio is very popular with the locals and allows the diner a wide spectrum of palette. Among the dishes are octopus (grilled or boiled), crab salad, fried cheese, salads, potato salads, small fried fish, fried meat balls, tarama salad (taramosalata), tzatziki and other tasty and spicy dishes. 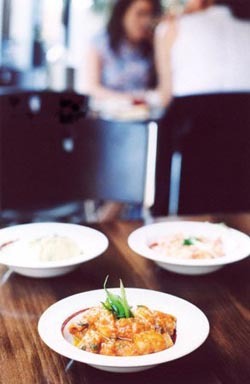 Orders can be given either by menu or the waiter may recite the day’s dishes. Prices are on the menu. By law, the cover charges (bread and bottled water may be refused) and the tip is always included in the final price but if really satisfied a customer may choose to leave something extra for the waiter. Ask for an itemized bill and upon receiving it check to make sure that all is in order and you are paying only for what you have ordered; some restaurants may have less than ethical practices especially where tourists are concerned. It is advisable to purchase bottled water from sources other than those just outside or inside tourist sites; they tend to be much cheaper. It is common practice for canteens to inflate prices sometimes up to 400%! Renting a vehicle can be accomplished at any number of car hire outlets both big brand name and smaller local businesses scattered throughout Greece. Obviously your paperwork and licenses must be in order and the process is the same as any other elsewhere in Europe. As a whole Greece’s roads are at best serviceable in the city and suburbs but since the 2004 Olympics several major road works have been accomplished; notably the Attiki Odos (Attica way) surrounding the greater Athens – Piraeus area linking either end of the city from Lavrio to Perama and in northern Greece the Egnatia Odos. Main freeways linking Athans to southern and northern Greece are constantly being repaired, widened or upgraded. There is just one piece of advice we will offer: get a GPS unit or you are lost! Although Greece has more than enough road signs, a large proportion are inappropriately placed, hidden by trees, other columns and signs, non existent where they should be, incorrectly placed and mounted, sometimes misleading or inconclusive and in general ineffective to help the traveller get to where they want to go. This problem has been alleviated to a large extent on the modern major highways previously mentioned.